European green crab is one of most hated invasive species. But it has helped save critically damaged Cape Cod marshes in the US by driving down the population of purple marsh crab, a native species that has multiplied out of control. Breathalyzer tests have long been used for checking drunk driving, but it could be used to diagnose a wide range of illnesses in the future. It has long been known in Chinese medicine that smell of exhaled breath holds clue to a person’s health. But for the first time scientists have proven that compounds in exhaled air have a unique molecular composition, making a person’s breath as unique as his/her fingerprints. An age-old European folk remedy can come in handy against bed bug menace. In Balkan countries people would scatter leaves of kidney bean plant on the floor by their beds at night. As the bugs would come out of their hiding places and crawl towards the bed, hooked hairs on the leaves would pierce and trap them. 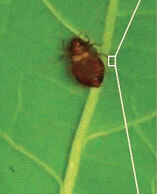 In the morning, the leaves would be full of immobilised bed bugs, which would then be burned. 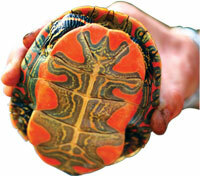 The genome of the western painted turtle, one of the most abundant turtles on Earth, has been sequenced. This is the first turtle to have its genome decoded and the analysis reveals that turtle genome evolves extremely slowly—at a rate about one third of the human genome. Traditionally, materials either repel water or attract it. Now, a material has been designed that can switch between two states. The liquid-infused composite of four layers is smooth, transparent and flat in resting state and liquids can flow freely down its surface. Ozone pollution is not just bad for plants it also impacts insects’ ability to find plants and flowers. Insects are able to locate their favourite plants by following the trail of certain aromatic compounds released by those plants. 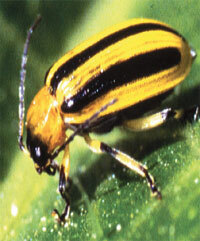 But ozone degrades these compounds and renders them ineffective in stimulating the antennae of the insects. The day is not far when we would have biodegradable electronic devices that would completely dissolve away once they are no longer needed. 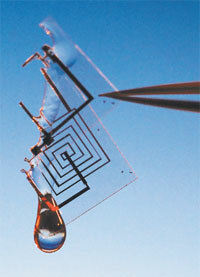 Using a technology called “transient electronics”, scientists have developed several experimental devices like medical implants that dissolve harmlessly in the body after a fixed time and wireless environmental sensors, solar cells and digital cameras that dissolve away in water after a pre-fixed period of time.